A new client of mine (we’ll call her Judy), came to me crying. Breathing hard, and fighting back tears, she shared what happened to her the day before. She took her toddler to the playground. He wanted to go down the slide, but was afraid to go down alone. Being a good mom, she agreed to go with him. Halfway down, Judy got stuck. Imagine that was you. Or maybe it’s happened to you, and you know exactly what that shame is like. Other parents and kids are all around. Everyone can see you. And there’s just no avoiding the truth of what’s happening. This was her moment of truth. We all have them, these moments when reality is reflected back to us. And it hurts. It hurts like your heart getting crushed. You just want to cry, or hide, or disappear, or lash out at your family or stuff your face. Anything to avoid the truth about what is happening. Summer offers many moments of truth, especially for those trying to lose weight. Trying on the bathing suit. Wearing the skirt that stops at your knees. Waking up to the day that it’s too hot to wear the drape-y cardigan that hides your stomach fat. Standing in front for the family reunion pictures...that you’ll be untagging yourself from as soon as they’re posted on social media. Or, like Judy, trying to use your body in some way and your weight stops you cold. On a slide, at the pool, in the dressing room with those awful three-part full-length mirrors. But whatever your moment of truth is, the moment itself is actually less important than what happens next. Judy could have chosen to bury that moment of embarrassment on the slide. She could have downed a gallon of Ben & Jerry and zoned out to Netflix. She could have run as fast and as far as she could have from those painful emotions. She could have tried to disappear. Instead, she reached out. She asked for help. She said, No more! She declared that now is the time to look straight at the truth, and seek out the support to address—and change—that truth. Even even if it’s terrifying. That is courage. And that is what it takes to make real change. If you’re feeling horrible about your weight, don’t run from your moments of truth. Instead, give yourself permission to ask a few questions and get clear on why this moment affected you so much, and what you’re going to do about it. What just happened, and why does it matter so much to you? What needs to change in order to keep that moment from ever happening again? What action can I take today or in the next few days to start making change? Staying present and positive in the midst of discomfort, or downright emotional pain, isn’t easy. But remember, such moments don’t have to be fixed points of shame. They can be opportunities to move toward our goals. The truth has the power to change your life. And my team and I are here for you when you’re ready! You know what helps you face those moments of truth? Knowing what to do. Having a plan. 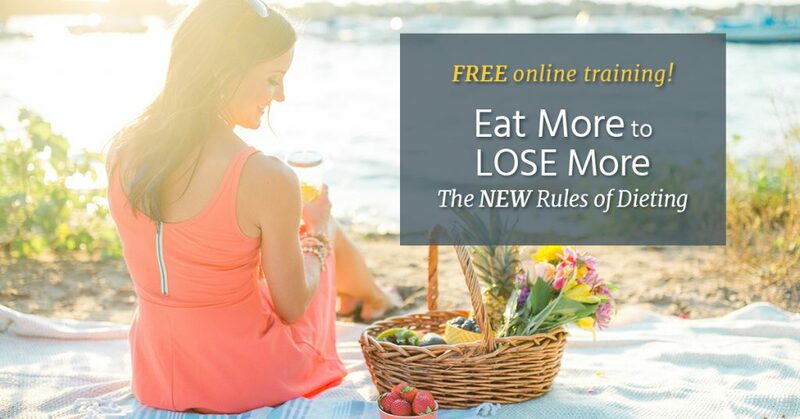 ...then hop on my FREE online training: Eat More to Lose More: The NEW Rules of Dieting! Great article. It is so full of hope and joy!